Whoever the new Mayor and Council will be, the outgoing officials will be leaving a very large present for them. 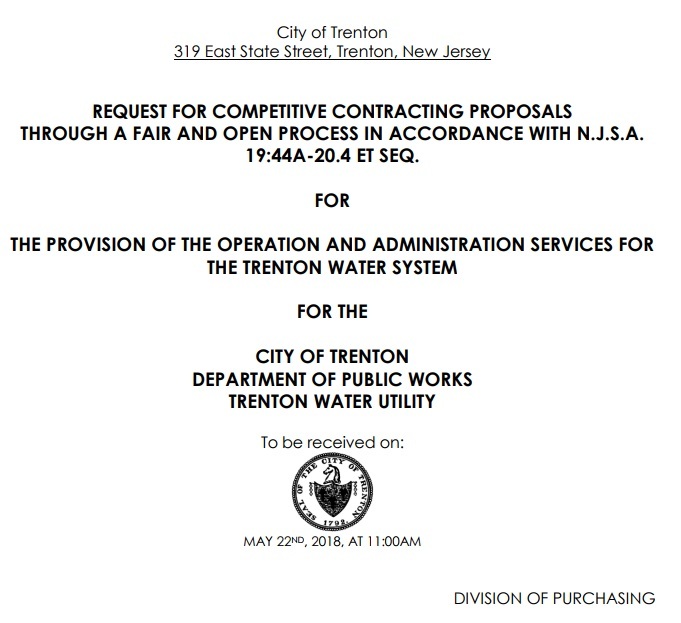 The City is soliciting proposals for vendors to provide “Operations and Administrative Services” for the troubled Trenton Water Works (TWW). This is in addition to the contracts in place with the Wade Trim and Banc3 engineering firms, who are providing personnel for technical operations with the utility. Unlike those two contracts, which were written for one-year terms, this Request for Proposals (RFP) envisions a three-year term for this proposed deal. As you can see from the image above, proposals are due to the City by May 22. Conceivably, a contract could be awarded and put in place by the end of June. The new Mayor and new Council may have no input into this contract, and may have to live with it for three years of their terms. Clearly, much, much more work is desperately needed at the Water Works. Much of the day-to-day chaos at the Filtration Plant and other TWW facilities has died down since the beginning of the year when emergency contracts for Wade and Banc3 were hurriedly written and signed. The pace of water quality incidents and required notification letters has dropped off considerably from last year’s record-setting pace. The prospect of putting out $2,000 to $5,000 is something that would scare the bejeezus out of any homeowner. It would scare me, although we didn’t get a copy of the letter. Presumably our service line is ok. Presumably. 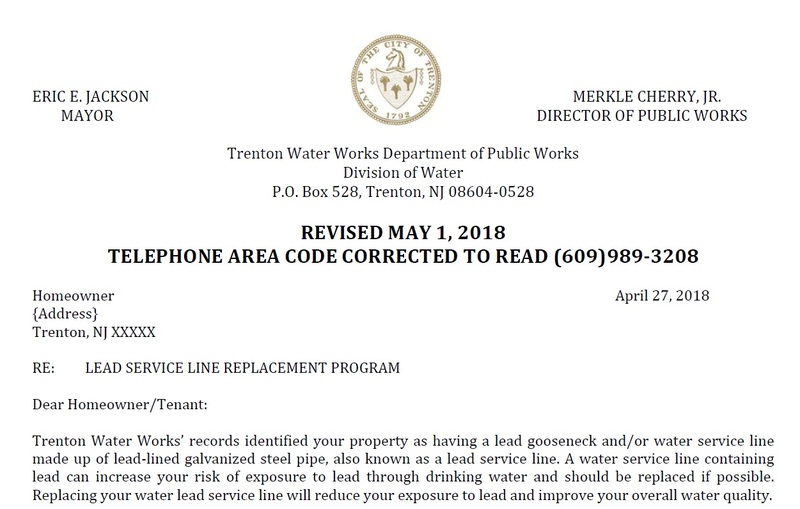 The letter will lead people to believe that they have lead lined pipes from the water main to the curb and also lead-lined pipes from the curb into their houses. It is unlikely that the utility pipes from the water main to the control valve, also known as a curb valve, are lead lined. There may be some lead-lined pipes but most of the older pipes are probably just unlined galvanized iron pipes. What is likely is that the galvanized pipe is connected to the water main by a piece of lead pipe, which is about 18-24 inches long and is sometimes called a gooseneck. The property that received this letter does not have a lead-lined pipe from the curb valve to the meter in the house. It has copper. Nevertheless, the occupants wouldn’t necessarily know that and could sign on for replacement of a customer-owned service line that doesn’t need to be replaced. When the City’s contractor attempts to replace the line, hopefully, the contractor would recognize this and the contractor would not replace the line. However, the contractor would then be looking for someone to pay for the contractor’s time and lost profit. Or, the contractor would just replace the line and the homeowner wouldn’t know that it wasn’t necessary. Although each homeowner’s situation may be different, anyone who received the letter should be concerned, but might not want to shell out thousands of dollars right away, until more details of this Program are known. And more trustworthy information, too. Just in case Mr. Pyle’s advice isn’t persuasive enough, maybe this detail might suggest to you that this letter might not be 100% accurate: the version on the City’s website, the one linked above, is an online correction to the one TWW’s customers this week. The mailed copy of the letter listed the wrong area code for the Water Department. Yep, the area code given was 973, NOT 609. Oops. If the folks in the Water Works can’t even get their own phone number right, maybe they do need help with their Operations and Administration. Which brings us back to the RFP. The Successful Responder shall be responsible for the direction of the operation, management, administration, maintenance and repair of the Water System in compliance with all permits and Administrative Consent Orders, in accordance with the Agreement. Meeting the terms of the Administrative Consent Order entered into by the City of Trenton and the New Jersey Department of Environmental Protection on February 5, 2018 shall be the priority. It’s a very good sign that the City seems to be serious about complying with the terms of this year’s Administrative Consent Order (ACO), considering how it essentially blew off the last couple. To actualize this plan, the RFP envisions several management and operational personnel to be provided by the successful bidder. Below is the list of 20 positions as written on Page 33, in Schedule C. Eleven positions are anticipated to be filed at the very beginning of the contract, with another 9 following on in later weeks and months. This new vendor will be in place for at least several months alongside two others, Wade Trim and Banc3. 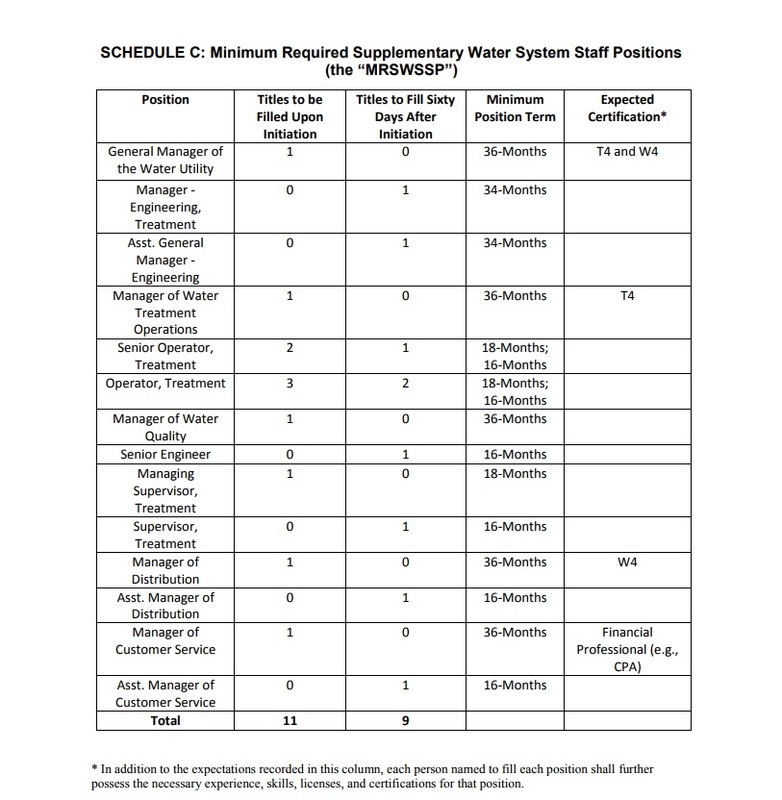 Some of the positions to be filled by this new vendor, such as “Senior Operator” and “Operator” sound they may overlap with similar positions provided by the two existing vendors. How are all of these vendors intended to work together? Will Wade Trim and Banc3 transition out of TWW at the conclusion of their one-year contracts, or will they continue, alongside this new vendor? The current contractors appear, as far as it’s publicly known, to be providing its personnel from outside the city. Will this also be the case for these 20 new positions? After all this activity started during the last several months, how many city residents will be employed at the end of this process, compared to its start? How will the addition of all of these commercial contractors and new personnel affect the utility’s rates and budget? 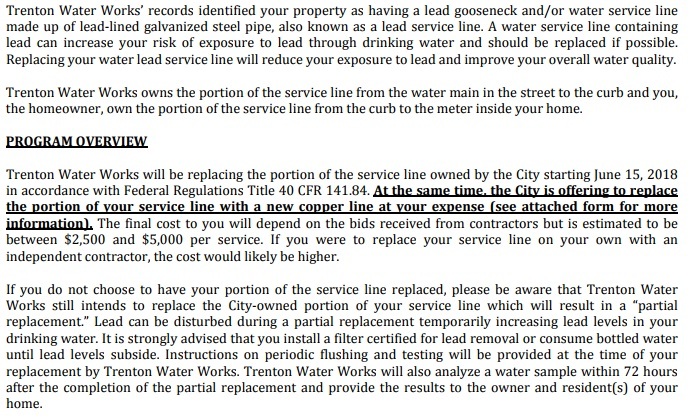 All of this activity – the 2 current contractors, the proposed new one, new initiatives such as this “Lead Service Line Replacement Program” – seem to be all parts of a grand new plan for the Trenton Water Works. Does this current, outgoing Administration have any intention of letting the public – the residents and ratepayers of the City of Trenton as well as the tens of thousands of customers in the rest of the County – in on what exactly this plan is? All of us, as well as those who are seeking to be the city’s next Mayor and Councilmembers, would appreciate – and frankly deserve, after the last several chaotic years – to know what the plan is before it is set in stone. Right now, the only way we are hearing about these new plans is by unanticipated letters in the mail (with wrong phone numbers! ), and being tipped off to important purchasing plans located in the depths of the city’s website. As of today, it looks like this Administration is being consistent with its behavior over the last four years. It’s taking care of major city business, and making crucially important contractual deals, while leaving its citizens and customers uninformed.